The domain thesweethome.com 301 redirects to thewirecutter.com, no one will argue that. But when you do a site command for [site:thesweethome.com] in Google, Google lists thesweethome.com and not thewirecutter.com. This is intentional and has been how Google does this for years, as far as I can remember. I think that if you site: for a specific domain, we'll show the domain you searched for regardless of the 301 even though we'll recognize the 301 for ranking purposes. @JohnMu might be able to say better. We know that the old URL is equivalent to the new one (clicking on the old one goes to the new one), so we may show the current (new) content with the old URL, if you're explicitly asking for the old URL. We're not showing the old content if we've processed the redirect. 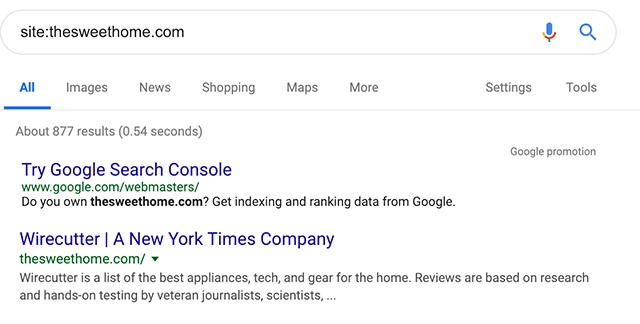 If you do a rebrand and people explicitly search for your old one, I think showing them where to go is a good approach. I realize y'all use site:-queries for website/search diagnostics, but ultimately they're for users. So you'd prefer not to be found at all after a rebrand? That feels like a weird approach to rebranding. I kind of agree with Google here.